Do you want your house to be cozier and homey? To get a very comfortable house, first, you can start it with the DIY shoe rack. Why does the shoe rack play the important role in the comfort of a house? That is because the shoes themselves can bring much dirt to the house. Once you step to the outside world, your shoes will be in touch with the soils, the dirty floors, etc. If you don’t put the shoes in a place, your house can be such a mess. Moreover, if you have the children. Do you have any empty cans that used to be paint cans? 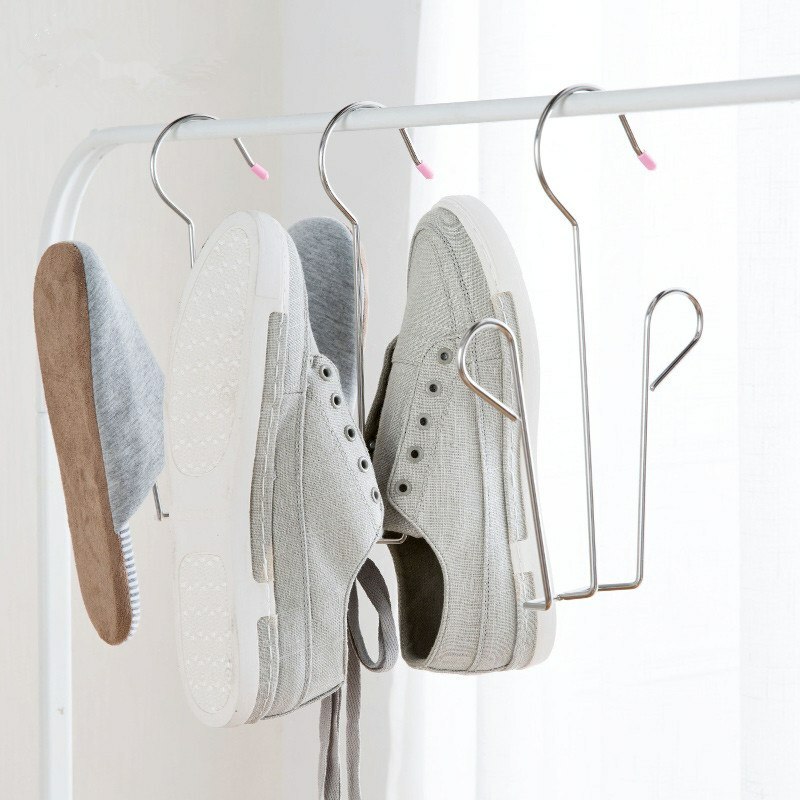 Instead of keeping those things in your storage, you can start to turn them into a unique DIY Shoe Rack. First, clean the cans that you will use to make the shoe racks. Apply the glue in the bottom part of the cans. Stick the cans to the wall. The arrangement is up to you. Put your shoes and sandals inside the cans. One can for one pair. That’s enough. Now you have not only an artsy DIY Shoe Rack but also affordable. No need to spend the money again. If you think that the silver cans are too boring, you can decorate the can the way you want. Maybe you want to decorate the can with some stickers or paint them with the colorful colors. That’s all up to you, actually. Buy some hangers. 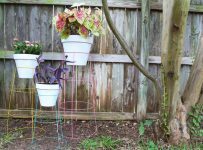 You can get them on the hardware stores with the affordable price. Put the hanger in the clothesline. 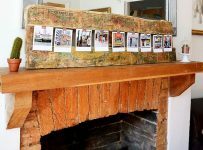 Prepare 3 rectangular repurposed kinds of wood. Make some holes in the left and the right side on each wood. Put the black pipes through the holes to link every repurposed wood. Stick the mat in the top and in the bottom of the pipes. Do you have any unused cardboards? Don’t just keep them in the storage, you can turn them into anything. 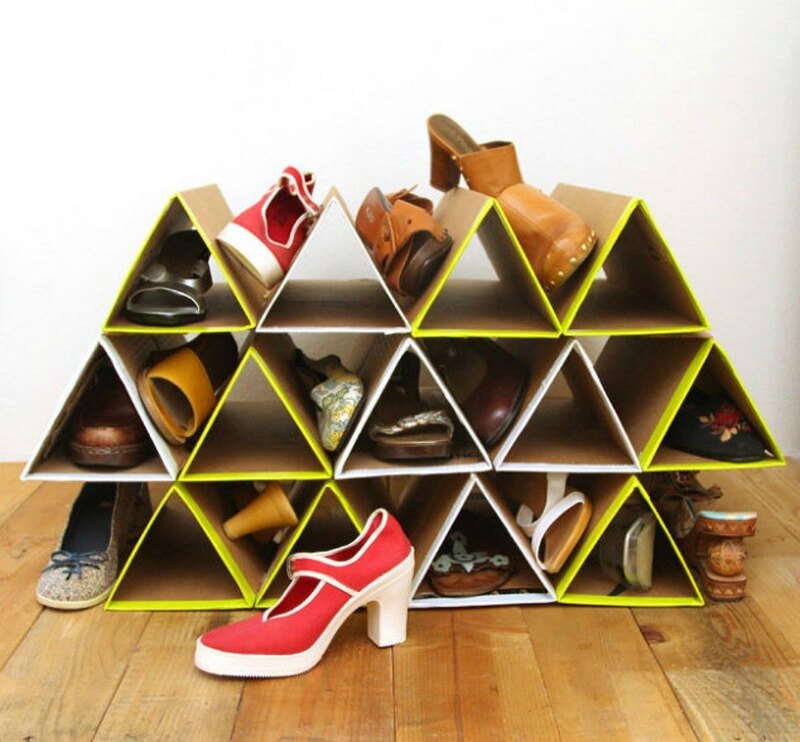 For example, the triangle DIY Shoe Rack that looks like a bunch of pyramids. It is so unique but minimalist. Fold the cardboard and make them some triangle prisms. Stick the edges with the glues. Pile up all the prisms. Put the shoes inside the hole. Cut the repurposed woods and assemble them to make some boxes. Paint each box with the different colors. Nail the boxes to the wall. Put all your shoes inside the box. Do you think that the idea to put the shoes on the table is impolite? However, you are not totally true. You can also put the shoes on the table with this DIY Shoe Rack made from a rolling desk and two small tables. Put a small table inside the rolling desk. Above that small table, put the smaller table. You can put your shoes there after that. So simple, right? Stick a piece of wood in the wall. Then, stick the curtain handle in that wood. After that, you can hang the shoes in the rings. 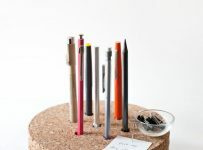 It is so simple and can save your space. Remember to nail the curtain handle well. If you don’t pay attention to this step, then there will be a chance that your curtain handle will fall and you have to fix it again. Of course, you don’t want that thing happens to you. Do you have unused skateboards? Or you just want to have that cool shoe rack? You don’t have to buy it. You can make it by yourself. 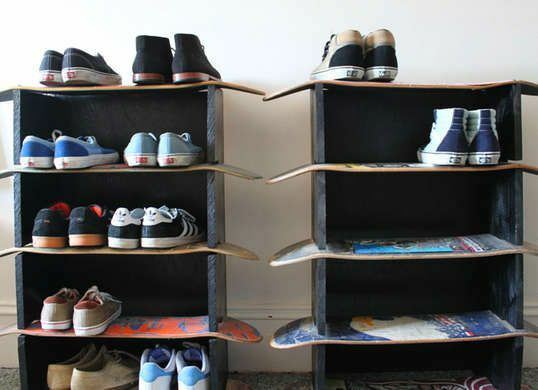 Using the skateboards, you will have a very cool and unique DIY shoe rack. Prepare some skateboards with different colors. Nail them into the wall. Put your shoes above them. Use some small wooden boards in dark colors. Nail them in the tilt position, horizontally. Who says that the crown molding can only be used to border the wall and the ceiling? 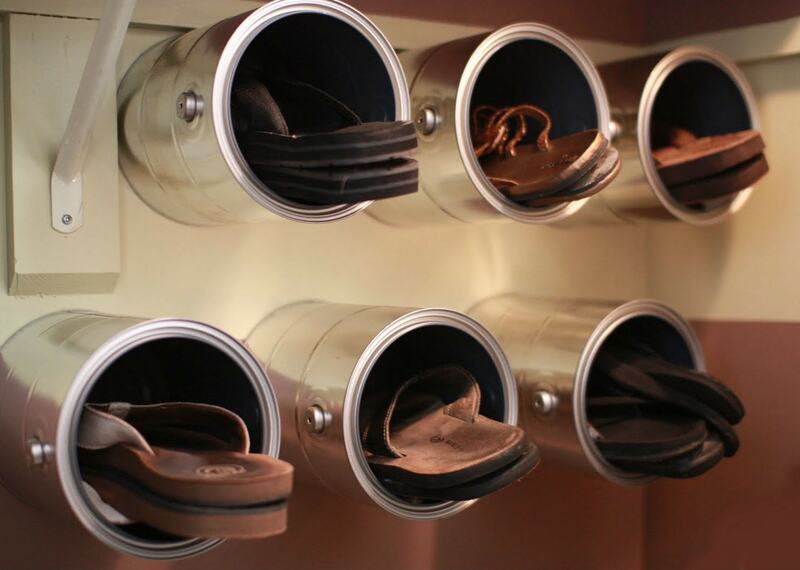 You can also use it as a shoe rack! Install the crown molding in the wall. Hang the shoes in the crown molding. 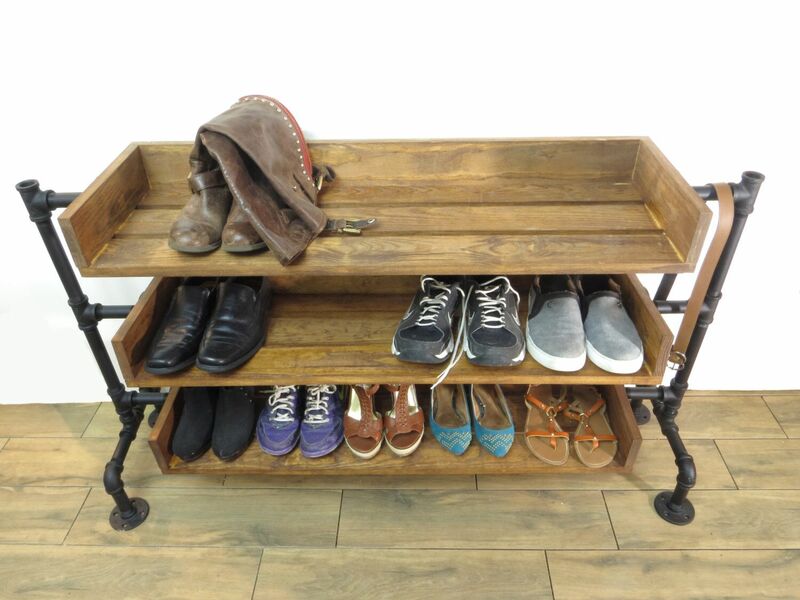 With the simple and repurposed goods in your house, you can have a magnificent DIY Shoe Rack. No more mess house and no more dirty floor. So, who said that you must spend a lot of money to have the proper shoe rack? That is a myth that you can break with your creativity!